Motorola on Wednesday announced a new keychain accessory called Motorola Keylink, which can pair with your smartphone and can find it within a radius of 100 feet. It works both ways, and can help find your keys also. The Motorola Keylink phone and key finder is priced at $24.99 (approximately Rs. 1,500) and can be purchased from Motorola.com and T-Mobile starting Wednesday, says the company. The Keylink is a small Bluetooth-powered accessory that can get attached to any keychain and paired with any Android (version 4.3 or higher) and iOS (version 7.1 or higher) smartphone using the Motorola Connect app, which is available for download from Google Play and the App Store. The company claims that the battery inside the Motorola Keylink lasts upwards of a year and is replaceable with a normal coin cell battery. “If your phone decides to play hide and seek with you, you can press a button on Keylink to make it ring up to 100 feet away. 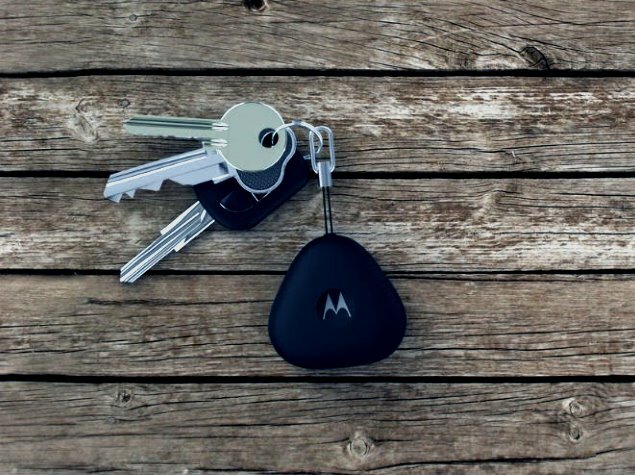 Or if your keys get a similar idea, you can use the Motorola Connect App to make Keylink ring,” notes company on its official blog. Motorola also said that the Moto X (Gen 2), Droid Turbo or devices with Android 5.0 Lollipop can now use ‘Trusted device’ settings to enable the added ability to keep the smartphone unlocked when the Motorola Keylink is nearby. On Tuesday, Google reportedly had also rolled out the ‘Trusted places’ option in the Smart Lock menu for all Android 5.0 Lollipop devices alongside new Google Play services 6.5. With the new option, users are able to choose a trusted place, and their device will remain unlocked in that area. Users will also be able to set trusted places with toggles for Home and Work location in the Trusted places menu using Google Maps.